The woman behind the counter at Boots the Chemist had yellow fuzzy ears on. Owww! she said they do pinch. They’re giving me a head ache. I’ll ask them in the dispensary if they’ll give me something. All in a good cause though. It’s the BBC Children In Need fund raising day. Oh, and here’s a £2 off voucher for hair care products. 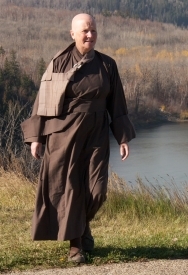 I’d got my hat on but she knew I was a monk. Well sometimes you grow some, don’t you? Finally I agreed to accept the voucher and give it to somebody who could use it. At the electrical shop the man knew right away what size night-light bulbs I needed. The good people of Hexham know us through and through. I enjoy the familiarity of strangers, their kindness and their openness. And later, after a Chinese lunch back at the monastery, back on the road again south to Harrogate. My chance to sample the tranquility of Northumberland. Perhaps however a tad more solitude than I’d intended having entered into yet another adventure with the TomTom satnav. Climbing up a thin ribbon of black, single track, tarmac out of Weardale I did wonder if this was the fastest or the shortest route I’d chosen. A distinction that is really important when it comes to travel in these parts. As the high moors opened in all their bleakness I’d have been glad of some familiarity of strangers, anybody even a sheep! I last traveled this road over from Weardale to Teesdale on Good Friday 1990. I remember it well. I remember the stopping and opening and closing of gates, three of them this time! Even then the gates where potent symbols. I was on my way to Reading to be introduced into the ins and outs of running a small church, priory as we called them. That day marked a huge change, from living in the middle of moors to living in a notoriously rough housing estate. Thankfully I came to know that practice is not dependent on tranquil surroundings, I even came to see beauty in the litter blowing in the street. A good friend is heading off for a big adventure tomorrow. I hope she experiences the kindness of strangers, and chooses the fastest route to return by. I’m still not sure if it was the fastest or the shortest route I took to Harrogate but it certainly gave me enough time and space to contemplate my friends adventure. In the end I chose not to say goodbye. Just good fortune. To Leeds tomorrow for a day retreat and then back to the moors.